Every once in a while, if you are lucky, you witness a performance on the track that takes your breath away. 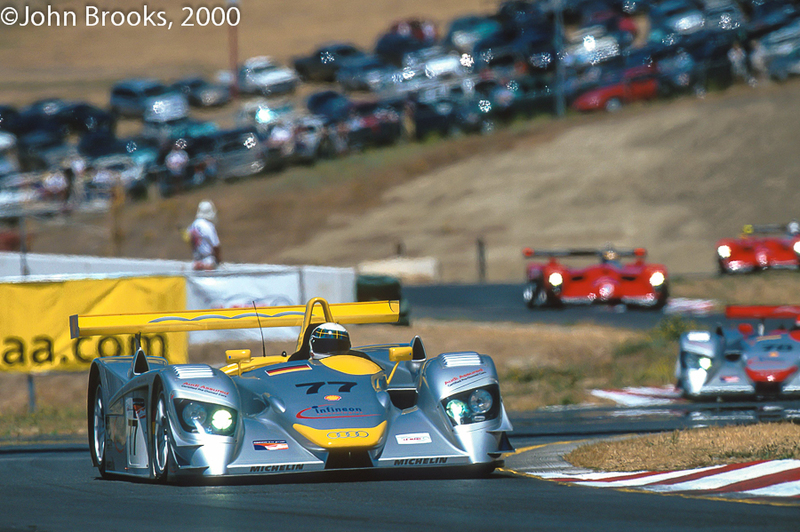 For example, I look back to Sonoma County in July 2000. Allan McNish, still smarting from not being allowed to fight for the top step at La Sarthe, put on a display that crushed the rest of the field. By the time the Wee Scot handed over his Audi R8 to co-driver Dindo Capello, he had lapped the opposition. That list included two factory BMW V12 LMRs and two works Panoz LMP-1 Roadster S entries, oh and Emanuele Pirro in an identical R8. I struggle to remember such a dominant display. Here is Allan on lap two already pulling away from the other Audi, with the Panoz pair shadows in the distance and who knows where the BMWs were? Days in the Sunshine…………………California Dreaming. This entry was posted in Nostalgia, Notes from the Cellar, Real Men, The Blink of An Eye and tagged Allan McNish, ALMS, Audi R8, Sears Point Raceway on December 10, 2012 by John Brooks. I am putting together the 50th Anniversary of Sears Point (Sonoma Raceway) book for the track and am looking for period photographs of racers at the track. I like what you have posted here and would love to use them and anything else you may have of the track.